One of the absolute best perks of being a Zumba® Instructor in the Zumba Instructor Network™ is having the opportunity to attend ZINCON (the Zumba Instructor Convention) each and every year. 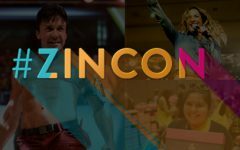 ZINCON is arguably the very best weekend of the year – it’s an opportunity for ZIN™ Members to take classes taught by their favorite master instructors, train for new programs (like STRONG by Zumba®), and reconnect with thousands of friends from every corner of the world. And with celebrity sightings throughout the weekend, it’s a crazy fun event! Spotted at past ZINCON events: Ashley Judd, Timbaland, Pitbull, Shaggy, Vanilla Ice, Wyclef, and so many more! 2017 marks the 10th year in a row that ZINCON has taken place, so you can only imagine the big news we’ve got in store for our lucky attendees! We are beyond thrilled to announce our special guests. Our host for the 2017 ZINCON Kick-Off session will be none other than Mario Lopez, who will be joined by his wife, Courtney! The fitness buff and host of TV show ‘Extra’ will be kicking off the weekend in what’s sure to be an unforgettable day. And the fun doesn’t end there! One of the highlights of ZINCON is the annual Fitness Concert – a 90-minute, half-million dollar production led by Zumba creator Beto Perez and his hand-selected team of Zumba Instructors. The concert always features performances by artists we love, set to choreography that’s impossible to ignore. So, who is headlining the 2017 Fitness Concert? Reggaeton sensation Daddy Yankee! We CAN NOT wait either! Seriously, this year is going to be one of the best one’s yet, so we highly suggest you do not miss out!! Register NOW for the July 27-30th event. And if you’re not yet a Zumba Instructor then – honestly – what are you waiting for? Get Peace of Mind for Your Business! #ZINCON is Coming. Are You Ready?